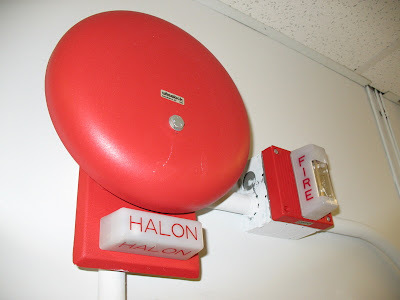 Although the sign claims that the halon alarm is a flashing light and horn, the alarm with the flashing light and horn is labeled "fire." 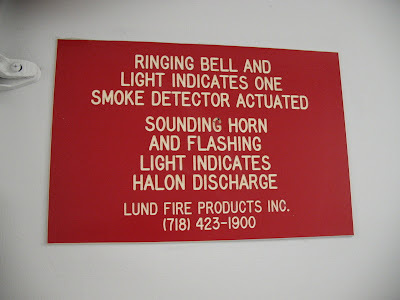 And the fire alarm is claimed to be a bell and light is, but the actual bell+light alarm is labeled "halon." 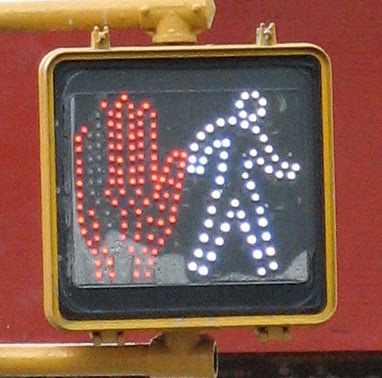 So I figure that if either of these guys goes off, I'll just run. NJIT has this new AI system that tries to answer questions about the library. They bribed me to test it out with chips and the (prospect of eating in the library with permission). is there a fine for reckless driving in the library? is there a fireplace anywhere so i can warm my toes? I lost my pet walrus in the library last Thursday, have you seen him? YU's Mendel Gottesman Library's floor layout is notorious. Due to the bizarre architecture, and probably also due to bizarre zoning regulations, the library has a number of "half-floors". For example, there's 2A between floors 2 and 3, and 3A between 3 and 4. 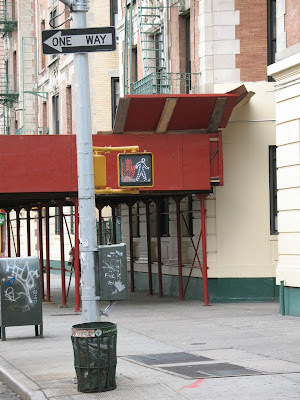 However, there is also "Elevator No. 3". 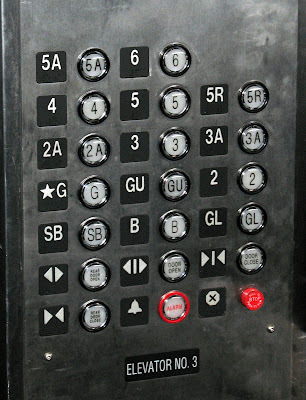 This elevator is used by librarians, and requires use of a key to call and ride. With one exception. So as not to potentially cause problems, I won't tell you what the exception is, but feel free to push all the elevator buttons you can find in the library. Aside from the standard floors, this elevator also included floors GL, GU, 3, 5R and 6! It also had four door open/close buttons. Eager to discover the hidden mysteries of the library I quickly pushed those buttons. 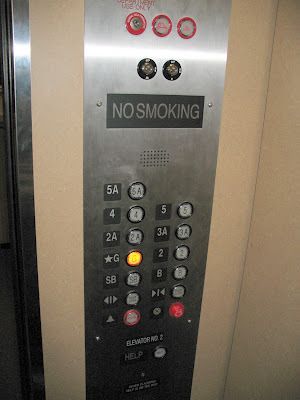 But, alas, although I was able to call the elevator, without a key I could not ride it to any of those floors. Then the doors closed and the thing started moving. I knew this meant that a librarian had called the elevator, and knew I might get caught. So I figured that wherever it wound up, I'd just pretend like I belonged there. When it got to the 6th floor, I said "Hi" to the librarian and started walking. It almost worked. She hesitated, looked at me in a puzzled fashion, and finally asked, "Do you have permission to be here? This floor isn't open to the public." So I played dumb and told her I didn't know that, but before she made me leave could I at least take a picture? 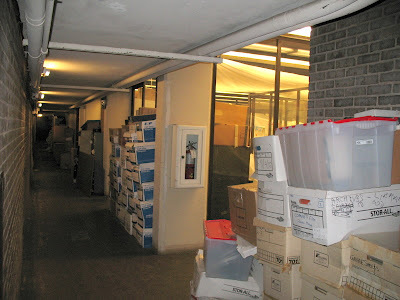 The sixth floor - not so exciting, to be honest. Maybe another time I'll find a way to explore the area more fully. I recently discovered this guy on youtube, and I am suprised Yoni hasn't done something like this yet. Some of you may recall City College's diskette vending machine. 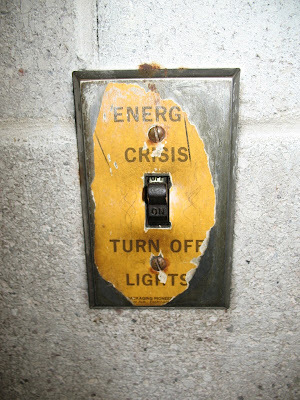 Here is another blast from the past, courtesy of the fairly dilapidated Marshak Science Building. And, although there's no shortage of cat-related stuff on the internet, people have been asking about our kittens. 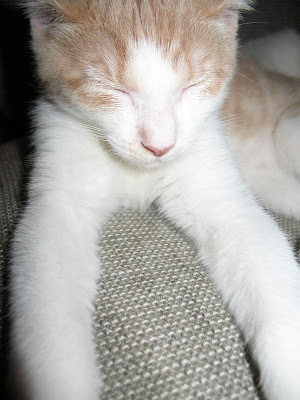 So here's two pictures of kittens sleeping, or being rudely awakened by a camera flash. 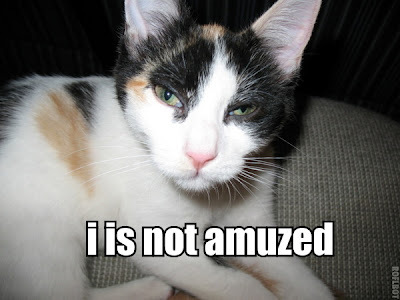 Sorry, I couldn't help LOLcatting (thanks, roflbot). This is the last time I'll subject you to this, I hope. I've been seeing a lot of these around the city, recently. I mean seriously a lot. (The burnt out red bulbs are not standard.) If I didn't know any better I'd say someone's figured out how to hack the things or something. Any ideas, peanut gallery? 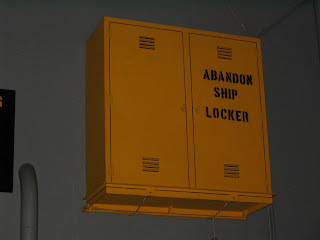 I discovered this in the navy section of the main branch of the National Air and Space Museum, I found it to be very funny.